Leslie Lehmann and William Waters are on the right just barely in the picture. I don't know if this was labeled correctly. 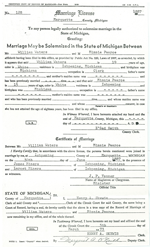 [S56] Birth Certificate for Muriel Watters.